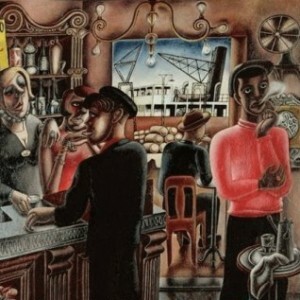 Edward Burra was an English painter, illustrator and stage designer. As a student at the Chelsea Polytechnic (1921–3) and the Royal College of Art (1923–5) he became a talented figure draughtsman. In the second half of the decade he spent much time in France painting intricately detailed urban scenes, which depicted the low life of Toulon and Marseille. Works such as the watercolour Toulon (1927) were executed in a meticulously finished and vividly coloured decorative style. Burra usually used watercolour and tempera and occasionally collage oil paints.